Toronto – February 21, 2018 – The last day of February is recognized globally as Repetitive Strain Injury (RSI) Awareness Day – a day established to help bring attention to occupational hazards that impact the lives of millions of workers each day. Also known as musculoskeletal disorder (MSD), the term repetitive strain injury (RSI) refers to a collection of ailments that affect the body’s muscles, nerves, and tendons. Some common examples of RSIs include tendinitis, tenosynovitis, and carpal tunnel syndrome. According to Statistics Canada, nearly 2.3 million Canadian adults annually experience a repetitive strain injury serious enough to limit their normal activities, and, apart from the emotional strain these injuries can have on affected workers and their families, the net cost of RSIs to the Canadian economy exceeds $26 billion dollars annually. “It is important that we recognize the impact that repetitive stain injuries have on the day-to-day lives of workers,” says UFCW Canada National President Paul Meinema. “The majority of these types of injuries are preventable. No matter the occupation, all workers have the right to a safe working environment with effective ergonomic regulations that address and prevent RSIs and other health and safety issues,” he adds. 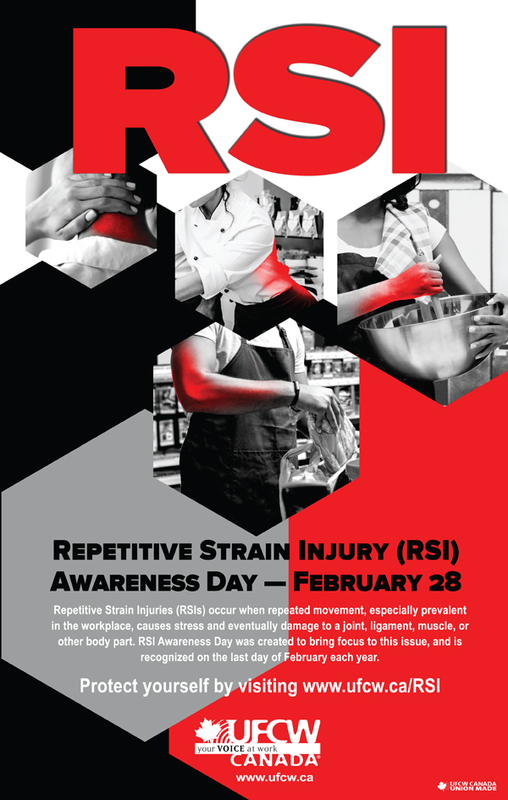 To raise awareness of RSIs at the workplace, UFCW Canada has created a new poster for RSI Awareness Day, which is available to download in both English and French.